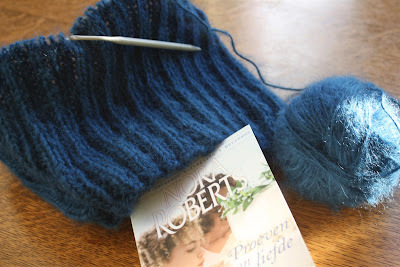 :: knitting: it's all about the process isn't it? I'm getting there, but it's just a few stitches at a time... Still working on that cowl. :: reading: not very highclass maybe, but I can always claim it's research ;-) I'm rereading the Bridal Quartet by Nora Roberts and loving it. :: writing: almost finished the proofreading for my latest book, and almost done writing that concept story too. Than there is one more big deadline to catch. Some very exciting new possibilities are opening up for me, but I can't say anything about that yet. So I'm very, very busy writing these days. It's like writing is my job... Isn't that great? and what a good job it is! i have only read one of nora robert's books - a long time ago. right now i read a lot of adolescent lit. partly to keep ahead of maddie and partly because there are some lovely books (shorter and quicker to read) out there. maybe someday i'll get a chance to write . . . really write . . . i would love that to be my job! anyway - i hope you have a happy thursday! hugs to you from far, far away!